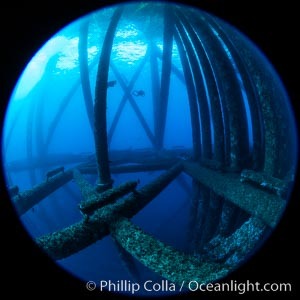 Oil Rig Eureka, Underwater Structure. Eureka Photo. Eureka Valley Dune Evening Primrose. A federally endangered plant, Oenothera californica eurekensis is a perennial herb that produces white flowers from April to June. These flowers turn red as they age. 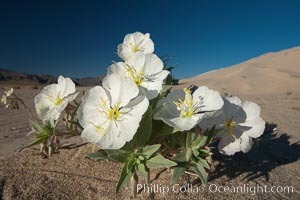 The Eureka Dunes evening-primrose is found only in the southern portion of Eureka Valley Sand Dunes system in Indigo County, California. Eureka Picture. Sunset on the Last Chance Mountain Range, seen from Eureka Valley Sand Dunes. Stock Photography of Eureka. 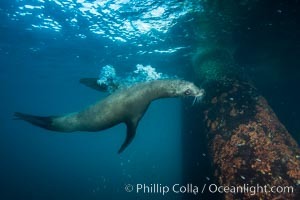 California sea lion at oil rig Eureka, underwater, among the pilings supporting the oil rig. Photograph of Eureka. 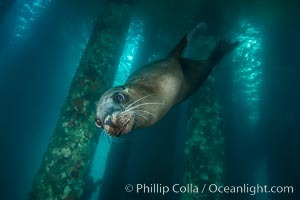 California sea lion at oil rig Eureka, underwater, among the pilings supporting the oil rig. Eureka Photos. Eureka Dunes. 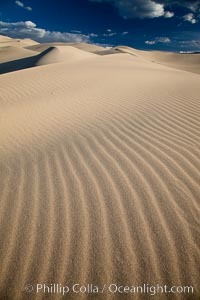 The Eureka Valley Sand Dunes are California's tallest sand dunes, and one of the tallest in the United States. Rising 680' above the floor of the Eureka Valley, the Eureka sand dunes are home to several endangered species, as well as "singing sand" that makes strange sounds when it shifts. 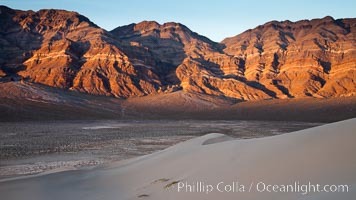 Located in the remote northern portion of Death Valley National Park, the Eureka Dunes see very few visitors. Eureka Image. 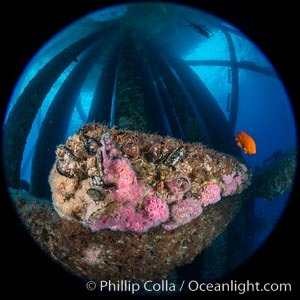 Oil Rig Eureka, Underwater Structure and invertebrate Life Professional stock photos of Eureka. 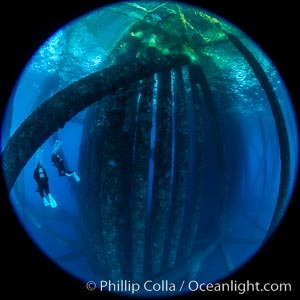 Oil Rig Eureka, Underwater Structure. Pictures of Eureka. 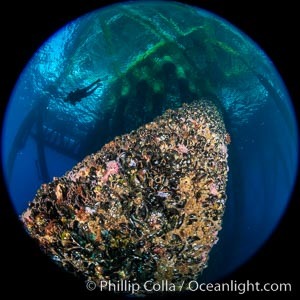 Oil Rig Eureka, Underwater Structure and invertebrate Life Eureka Photo. Sunset on the Eureka Dunes. The Eureka Valley Sand Dunes are California's tallest sand dunes, and one of the tallest in the United States. Rising 680' above the floor of the Eureka Valley, the Eureka sand dunes are home to several endangered species, as well as "singing sand" that makes strange sounds when it shifts. 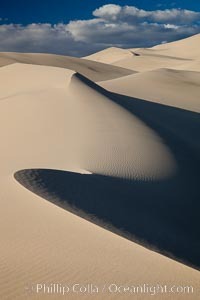 Located in the remote northern portion of Death Valley National Park, the Eureka Dunes see very few visitors. Eureka Picture. Eureka Dunes. The Eureka Valley Sand Dunes are California's tallest sand dunes, and one of the tallest in the United States. Rising 680' above the floor of the Eureka Valley, the Eureka sand dunes are home to several endangered species, as well as "singing sand" that makes strange sounds when it shifts. 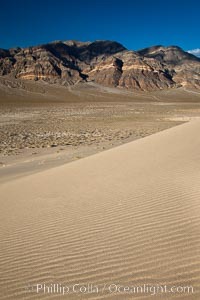 Located in the remote northern portion of Death Valley National Park, the Eureka Dunes see very few visitors. 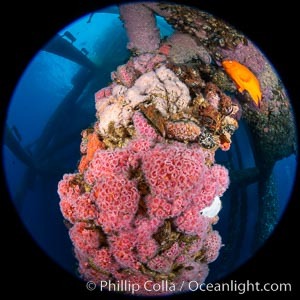 Stock Photography of Eureka. 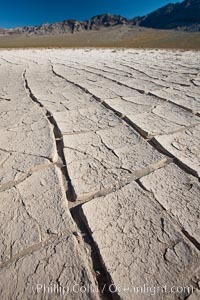 Dried mud, arid land, Eureka Valley. Photograph of Eureka. 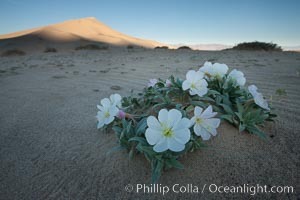 Spring wildflower blooms on the Eureka sand dunes. Eureka Photos. Eureka dune grass, and rare and federally endangered species of grass endemic to the Eureka Valley and Eureka Sand Dunes. The Last Chance mountains, lit by sunset, as visible in the distance. Swallenia alexandrae, a perennial grass, grows only in the southern portion of Eureka Valley Sand Dunes, in Inyo County, California. Eureka Image. Eureka Dunes. The Eureka Valley Sand Dunes are California's tallest sand dunes, and one of the tallest in the United States. Rising 680' above the floor of the Eureka Valley, the Eureka sand dunes are home to several endangered species, as well as "singing sand" that makes strange sounds when it shifts. 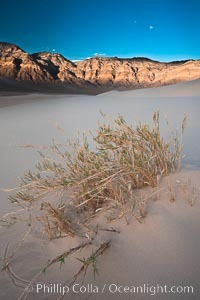 Located in the remote northern portion of Death Valley National Park, the Eureka Dunes see very few visitors. Professional stock photos of Eureka. 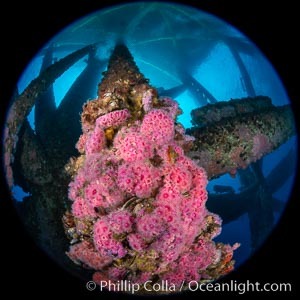 Oil Rig Eureka, Underwater Structure and invertebrate Life Pictures of Eureka. 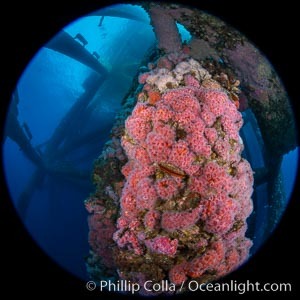 Oil Rig Eureka, Underwater Structure and invertebrate Life Eureka Picture. Eureka Valley Dune Evening Primrose. A federally endangered plant, Oenothera californica eurekensis is a perennial herb that produces white flowers from April to June. These flowers turn red as they age. 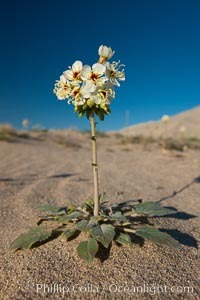 The Eureka Dunes evening-primrose is found only in the southern portion of Eureka Valley Sand Dunes system in Indigo County, California. Stock Photography of Eureka. Eureka Dunes. 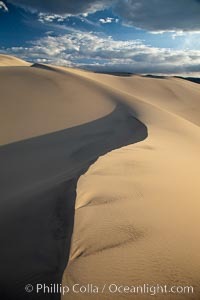 The Eureka Valley Sand Dunes are California's tallest sand dunes, and one of the tallest in the United States. Rising 680' above the floor of the Eureka Valley, the Eureka sand dunes are home to several endangered species, as well as "singing sand" that makes strange sounds when it shifts. 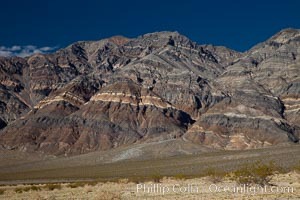 Located in the remote northern portion of Death Valley National Park, the Eureka Dunes see very few visitors. Photograph of Eureka. Eureka Valley Dune Evening Primrose. A federally endangered plant, Oenothera californica eurekensis is a perennial herb that produces white flowers from April to June. These flowers turn red as they age. 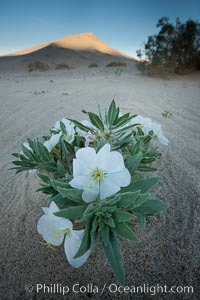 The Eureka Dunes evening-primrose is found only in the southern portion of Eureka Valley Sand Dunes system in Indigo County, California. Eureka Photos. 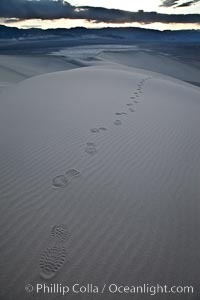 Footprints in the sand, Eureka Dunes. 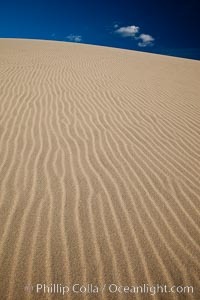 The Eureka Valley Sand Dunes are California's tallest sand dunes, and one of the tallest in the United States. Rising 680' above the floor of the Eureka Valley, the Eureka sand dunes are home to several endangered species, as well as "singing sand" that makes strange sounds when it shifts. 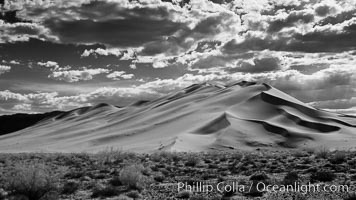 Located in the remote northern portion of Death Valley National Park, the Eureka Dunes see very few visitors. Eureka Image. Eureka Dunes. 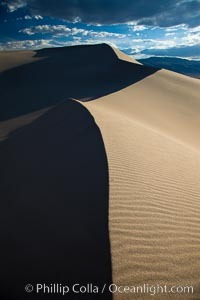 The Eureka Valley Sand Dunes are California's tallest sand dunes, and one of the tallest in the United States. Rising 680' above the floor of the Eureka Valley, the Eureka sand dunes are home to several endangered species, as well as "singing sand" that makes strange sounds when it shifts. 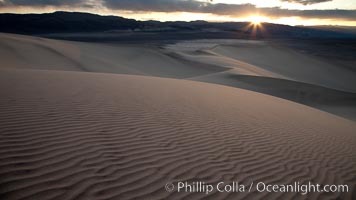 Located in the remote northern portion of Death Valley National Park, the Eureka Dunes see very few visitors. Pictures of Eureka. Eureka Dunes. The Eureka Valley Sand Dunes are California's tallest sand dunes, and one of the tallest in the United States. Rising 680' above the floor of the Eureka Valley, the Eureka sand dunes are home to several endangered species, as well as "singing sand" that makes strange sounds when it shifts. 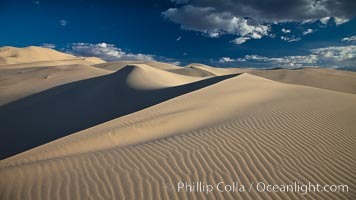 Located in the remote northern portion of Death Valley National Park, the Eureka Dunes see very few visitors. Eureka Photo. Eureka Dunes. The Eureka Valley Sand Dunes are California's tallest sand dunes, and one of the tallest in the United States. Rising 680' above the floor of the Eureka Valley, the Eureka sand dunes are home to several endangered species, as well as "singing sand" that makes strange sounds when it shifts. 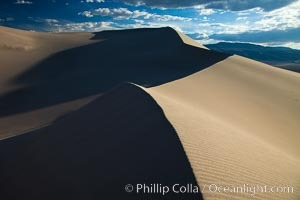 Located in the remote northern portion of Death Valley National Park, the Eureka Dunes see very few visitors. Eureka Picture. Eureka Valley Sand Dunes. 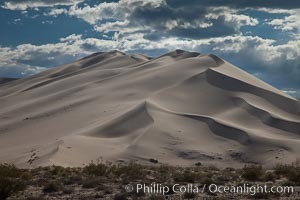 The Eureka Dunes are California's tallest sand dunes, and one of the tallest in the United States. Rising 680' above the floor of the Eureka Valley, the Eureka sand dunes are home to several endangered species, as well as "singing sand" that makes strange sounds when it shifts. Photograph of Eureka. Last Chance Mountains rise above the Eureka Valley. Eureka Photos. Eureka Dunes. 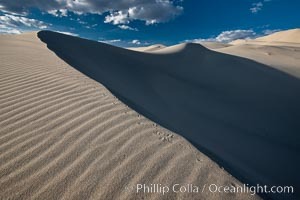 The Eureka Dunes are California's tallest sand dunes, and one of the tallest in the United States. Rising 680' above the floor of the Eureka Valley, the Eureka sand dunes are home to several endangered species, as well as "singing sand" that makes strange sounds when it shifts. Eureka Image.